Louis worked for the political unification of France, yielding Limoge, Cahors, and Perigeux to Henry in exchange for Henry's renunciation of all claims to Normandy, Anjou, Maine, Touraine, and Poitou (Treaty of Paris, 1259). He yielded French claims to Rousillon and Barcelona in exchange for the yielding of Spanish claims to Provence and Languedoc (Treaty of Corbeil, 1258). He largely eliminated the feuding and wars among French nobles and vassals that had ravaged France before his time. He protected vassals from oppression, and required their lords to fulfill their obligations. He reformed the system of taxation. He reformed the courts, so that every man in France, regardless of his station, had a far better chance of receiving justice than had previously been the case. He promoted the writing down of the law, so that it was clear what the laws were, and made major strides toward eliminating trial by combat in favor of trial by jury. (Trial by combat decided the guilt or innocence of the accused by a combat between the accused and the accuser, either personally or by proxy, with God being called on to uphold the right. Trial by ordeal required the accused to prove his innocence by, for example, walking across a bed of hot coals. Both were hold-overs from pre-Christian Frankish Law, and were vigorously denounced by many clergy, but took a long time to die out.) His reputation for integrity was such that foreign monarchs regularly asked him to arbitrate their disputes. He fought in two Crusades, both of which were total failures. In 1248 he led an army to the island of Cyprus, and was there joined by 200 English knights. 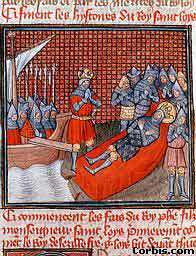 In 1249 they proceeded to Egypt and took the city of Damietta, but discipline broke down and Louis was unable to keep the soldiers from looting. Disease ravaged the camp, and in 1250 the army suffered a disastrous defeat at Mansurah and Louis himself was taken prisoner. His Arab captors were quick to recognize in him a mixture of military valor and personal holiness, and were accustomed to kneel when speaking to him. He and his handful of surviving companions were released on the surrender of Damietta and the payment of a large ransom. 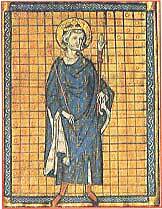 He sailed to Palestine, visited the few Holy Places that were accessible, and returned to France in 1254. In 1270 he joined another crusade, which landed in Tunis, where he immediately caught typhoid fever and died on 25 August. His biography, by a friend and comrade in arms, the Sieur Jean de Joinville, is available in English in Chronicles of the Crusades, Penguin Paperbacks.